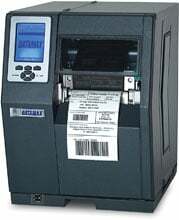 The H-4212 RFID provides outstanding performance, sound durability, and accurate print quality. The Datamax-O-Neil H-class family of printers takes printing into the next era of comprehensive thermal and RFID label printing. The new Datamax-O-Neil H-Class heavy-duty printer provides a state of the art modular design offering the most flexible and accurate print quality in the industry today. Designed with the new Datamax-O-Neil IntelliSEAQ technology, the H-Class makes available the most advanced diagnostics using a sophisticated approach in maximizing the life of the printhead while clearly reducing total cost of ownership. In keeping with Datamax-O-Neil high standards, the new H-class series incorporates a patented precision crafted design that is unmatched. This heavy-duty die cast aluminum frame assures reliable performance with high quality results. The H-class printers are designed for the most rugged environments supporting applications in such places as manufacturing, shipping and warehousing, but sophisticated enough to support high-resolution graphics and text on small labels.